Do I really need a cell phone AND a home phone? “Simplify your life” is today’s slow-it-down mantra. By applying that theory to different segments of our life, we can expect to save money, minimize stress and make room for those things we truly desire. Ah, but this is easier said than done. For instance, you don’t need 15 pairs of black shoes — but how cool is it to have the perfect pair at hand just when you want? And it’s true that most of your dinner party guests probably couldn’t care less that you have matching, seasonally-themed cups and napkins. Face it: It’s only easy to simplify if you’re making a change not just for the zen factor, but to improve your life in a way that matters to you. Too often, though, we’re so busy running around day after day, we don’t even see how we could make our lives easier by implementing a minor change or two. Stop for a minute and ask yourself this: Why do you need more than one phone? Why not drop your home phone line and connect to the world only via cell phone? Many smart people are asking themselves if it makes sense to be paying for two phones each and every month. And there’s an even stronger argument for just saying no to your local telecom company if you live in a household with two or or more cell phones. The US Consumer Expenditure Survey showed that the number of households with a cell phone and no landline in 2000 was less than half a percent — but by the first quarter of 2005, that number had risen to 7.8 percent. While the most people cancel their wired phone service mainly to save money, others cite convenience and simplicity as major motivators. She’s not alone. Recent research by the Pew Research Center reveals that 23 percent of people currently using landlines say they are likely to get rid of their landline and switch over to using just their cell phone. But is keeping a seldom-used line the best use of your money? Although you can definitely save some of your hard-earned cash by getting rid of your landline, it’s not the right plan for everyone. Before you go cutting the cord, here are some important points you will want to consider. The most important thing is the money you will save. You’re not just saving it once. It’s each and every single month. That adds up to a pretty substantial amount of money over a year’s time. The figure can vary quite a bit, anywhere between $30 for just your basic phone charges, up to $100 or more depending on how many long distance calls you make. Also, there’s an additional charge on your home phone if you want any extras included such as caller ID, voice mail or call waiting. These are typically all included as freebies with your cell phone. Most landline phones today use a little electricity… which means if the power goes out, your phone does, too, unless you have a backup that gets a charge directly from the phone wire. For the horror-film watchers (and otherwise paranoid folks): The bad guy can’t snip your cell phone line on a dark and rainy night, leaving you without any way to call for help. 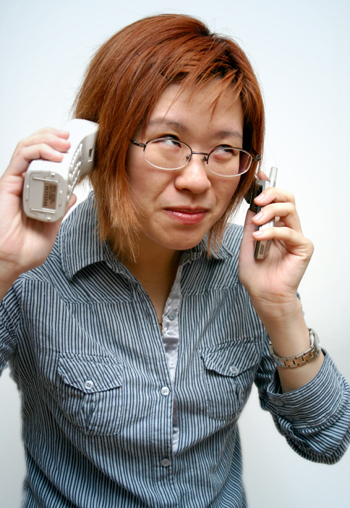 Here’s a big plus you may have overlooked: almost no telemarketers will bother you! No more dropping everything you’re doing and running to answer the phone just to find out it’s a salesperson. Finally, you won’t have to bother yourself with worrying about missing a phone call just because you gave someone your home phone number instead of your cell. No more having to stay at home sitting by the phone because so-and-so is supposed to call. You can also start a conversation at home and drive away while still talking — which is impossible for a wired phone. Of course, there are a few drawbacks — though these are mostly dependent upon your lifestyle and so won’t apply to everyone. Here are some things of which to be aware. What type of internet service do you have? If you are using the phone line for your service, you will have to make the switch over to cable, satellite or an equivalent alternative in your area. But just think: Once you get rid of dial-up, you will have a much faster ‘net connection. Many of you will be wondering about your TiVo. Good news! TiVo will work with your cable internet service. The only time you will need a landline is for the initial Guided Setup on your DVR, and that’s only if your DVR has TiVo software earlier than version 7.2. (If your DVR has a later version, you can perform the Guided Setup using a network connection. All Series2 DT and Series3 HD DVRs are 7.2 or later.) Go to TiVo.com to learn more. If you use a fax machine, you will have to find another way of transmitting documents. Alternatively, you can scan documents into your computer and email them as an attachment over the internet. There are also online fax services that cost very little to use. Fortunately, there is an ongoing, nationwide effort for improvement in this area. The system is called E911 or the a universal emergency telephone number system. Check with the National Emergency Number Association (NENA) for the most current updates and more information on this subject. “We don’t have great cell service, we drop coverage literally once we step onto our front porch. So it’s not even an option for us,” says community member Kristina. It’s true: cell phone coverage can be very spotty in certain locations, so make sure your phone works throughout your entire home before canceling your landline account. Poor cell reception is one of the leading reasons why people choose to keep their wired phone connection. With a landline, if you lose a phone… you just grab another extension. But if you lose your cell phone, you lose your line, too (at least until you can buy a replacement for way more than you would probably like to spend and then have the company transfer service to the new device). If you’re the type of gal who’d misplace her head if it wasn’t firmly attached, you might want to think twice about putting all of your proverbial eggs in one basket. If you’re a parent, there are a couple more things to consider. Children — especially teens — tend to spend quite a bit of time talking on the phone. So not only do you have to contend with the inconvenience of someone else using your phone, but you also have to make sure they don’t go over the allotted minutes you purchased with your service, or you just may end up spending more money than you’re saving. If you decide to take the plunge and go landline-free, these few tips can help make the transition as smooth as possible. Have a spare charger handy (perhaps one that works in the car) and consider investing in something like the Energi To Go battery operated charger, or the Sidewinder Portable Cell Phone Charger, which you power like an old-fashioned generator: by cranking a little handle. Does your calling plan has enough minutes to cover all your calls (including long distance)? You may need to upgrade your service contract. Be sure you know how to access your messages from another phone or land line, just in case your little cell meets a watery fate or otherwise gets broken. Until you’re able to get a replacement, you at least know you have voicemail for backup. Brush up on your phone manual and be sure you know how to use services like call waiting, three-party calling and call waiting. You won’t have a backup just in case, so doublecheck that it all works. The more you rely on the phone, the worse off you will be if something happens to your data. (All those programmed numbers!) Choose a phone that allows you to back everything up to your computer… just in case. Teeny tiny little phones can be a little hard to juggle while doing household chores. You might want to consider investing in a plug-in headset and a belt clip to make multitasking a little easier. Make sure your old number has a message giving people your new contact information, and doesn’t just automatically forward the calls. When it comes time for that forwarding service to end, you want people to actually know how to reach you. Since cell phone numbers typically do not appear in any phone directories, if there’s someone out there you think might want to get in touch with you — whether that means an old friend, long-lost cousin or a business contact — list your number in the appropriate spots online. Consider setting up your own personal web page, or adding your information to anywhere your business profile appears (such as LinkedIn or Plaxo). So there you have it: money saved with little or no sacrifice. Now you can be a savvy little saver and put that money away for a rainy day, or you can afford to take that vacation you’ve been dreaming about. And on that note… Before you get all excited to think about how you can take your primary phone line on vacation and never miss a call, realize that you might just be a little too connected. We suggest that every now and then, you power down your little buddy and see for yourself that the world really won’t stop turning if you go off the grid for awhile.